Truth be told, nothing beats listening to music while you drive with the cool wind from your windows against your face. But there are situations when we may desire to play a precise song or listen to a particular audiobook. This is when a car adapter is required. You can plug these devices into the lighter socket of your car and connect your smartphone or iPhone via Bluetooth or USB. This is so that signal can be transmitted to the adaptor via your device. 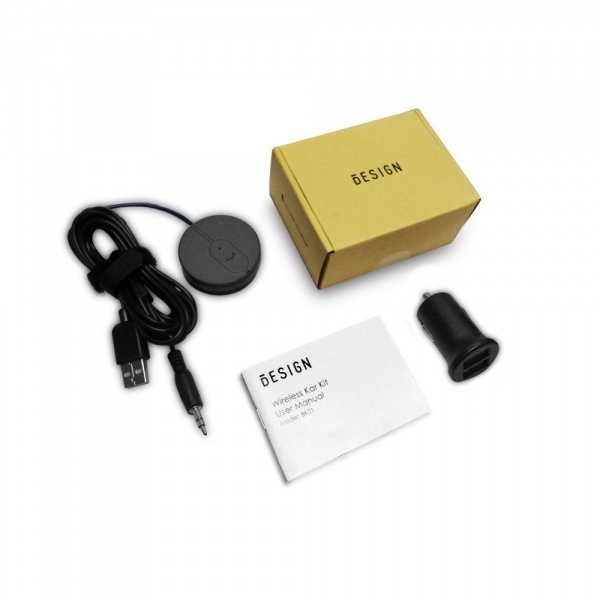 The best car adaptors come alongside Bluetooth which allows you to connect wirelessly without having to make use of an auxiliary cord. Additionally, great Bluetooth adaptors come alongside extra functionalities like wake or sleep mode and various modes of playing music which ranges from USB, Memory card, or Bluetooth. Car adaptors are very common because a host of drivers love to listen to their own songs or playlists instead of the radio. Nonetheless, not all cars have the AUX connection or Bluetooth functionality. Car adaptors are not pricey and provide you with audio output of very high quality. In light of that, if you want to take advantage of all that cars adaptors have to offer, we have put together a list of 10 of the best Bluetooth adaptors that are certain to give you your money’s worth. This car adapter was released in November 2015 and has become quite popular among lots of car owners. It is sometimes known as the AP-0674 model or the KM 18, which is the name on the box.When trying out any Bluetooth device, the first thing that is tested is the connectivity. The Nulaxy wireless Bluetooth transmitter pairs with any device effortlessly. You also observe a large LCD display on the device. On this display, you see if it has been paired, volume level, the title of the track, caller ID when calling, and the FM frequency. If your car radio does not come with an AUX port, then you are in luck. 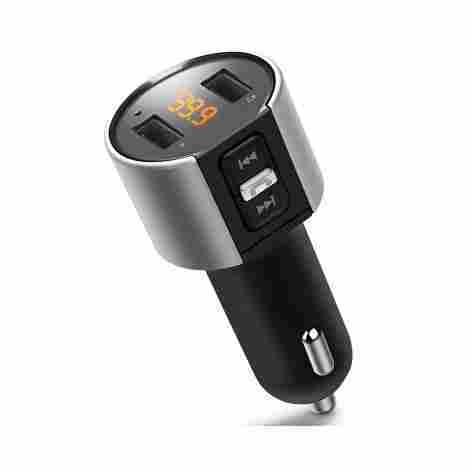 This Bluetooth car adapter comes with a 5mm AUX port to enable users to connect directly to their smartphone and other devices to enjoy music. You can also make use of a TF/SD card. The adapter also supports the use of Navigation apps and Music apps for more functionality. Using the Bluetooth adapter to access different music files is also possible with the control buttons which you can use in jumping to the next track, changing the FM frequency, Volume change, and more. Working together with the flexible gooseneck, the position of the buttons does not limit its usage. All you need to do is turn it towards yourself. The Nulaxy KM18 is one of the most affordable transmitters on this list with some great quality features. It is also quite popular among many car owners so you can be sure that you are getting value for your money. If all you are after is something mediumly priced, then this transmitter ensures you do not compromise on quality to get the price you want. Although there may be issues with the language, it is easy to make use of it once you know how to navigate through the settings. Moving, you likewise enjoy high-quality features like the latest Bluetooth 4.1 connectivity. This lets you connect to any car radio, headset, phone, home sound system, and tablet of your choice. If you don’t wish to use the Bluetooth, then you can also settle for the USB port. This allows the device to play music from an MP3 player. Remember, you can also use it in making calls and all music processing depends on the A2DP technology. This device cost slightly higher than the average price for these type of devices. The only positives are its functions and the fact that it comes with a money back warranty in case you feel you spent wrongly. Unlike most devices which function simply as either one of s receiver or transmitter, this device serves as both. 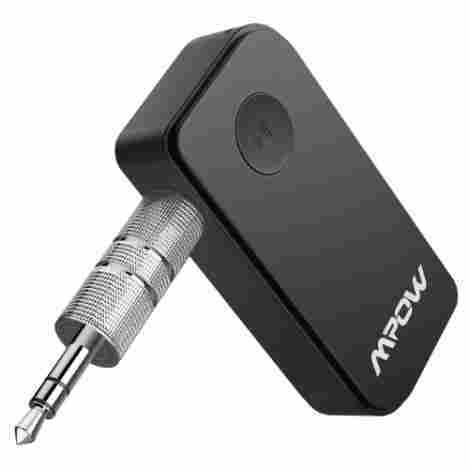 This means you can use it in transmitting the audio from a TV, CD / DVD players, and MP3 players to a connected speaker. 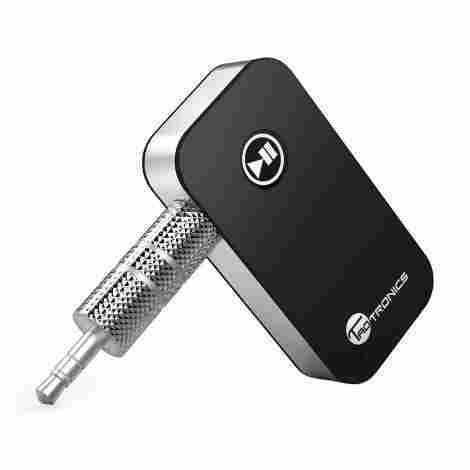 The TaoTronics Bluetooth car receiver is a great kit to have in your car at any time. The first thing you should know about this receiver is that it uses an inbuilt battery. This means you will need to recharge after a few hours or days depending on how you use the device. You can get up to 15 hours with heavy usage or 200 hours on standby mode. Selling at a very cheap, affordable price, it will surprise a lot of users to see all the great features which this device packs in its case. 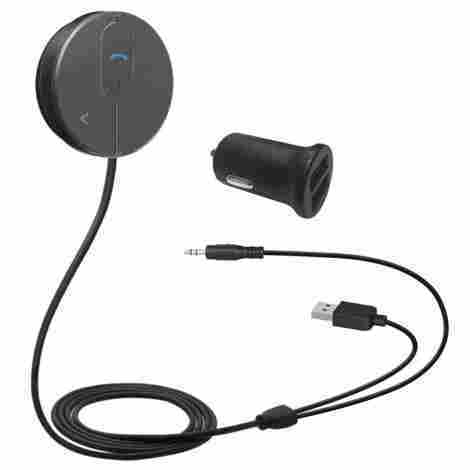 Coming up with new features to add to Bluetooth car transmitters is what makes any new release compete adequately. With this car receiver, the basic addition is the button which lets Apple device users activate Siri. There is also the multi-point feature and also the function through which you listen to your music while charging. 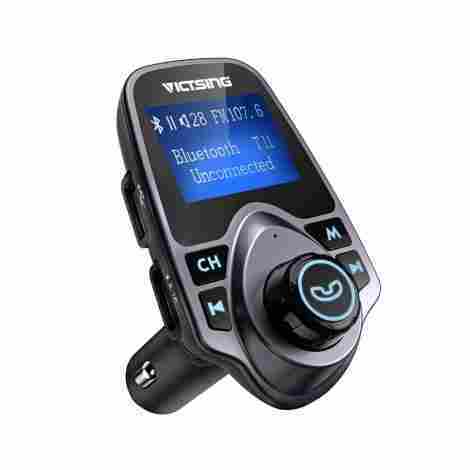 The VicTsing is another FM transmitter of excellent quality. It supports the use of hands-free calling and it also has a memory function which lets the transmitter connect automatically to the last paired device anytime it is turned on. With support for AUX cord, SD card, Bluetooth, and USB, there are many options you can select from when deciding on how to enjoy your music. You are not limited to ensuring a device supports Bluetooth, it just needs one of four options to play through your vehicle speakers. Additionally, there is also support for MP3. WMA, and WAV music formats. Another reasonably priced Bluetooth device that allows you to turn your car radio into a music system. An LCD Display, support for three different music files formats, and 4 music modes are just a few of the features which this device offers. For the price of this device, you really get double your money. There is a lot to look forward to with the LDesign FM transmitter for anyone interested. Unlike most of the popular car adapters, this one offers a much more modern style and features. The LDesign comes in up to 7 various colors from which users can pick their preference. It can also be used in any vehicle and with any Bluetooth device. 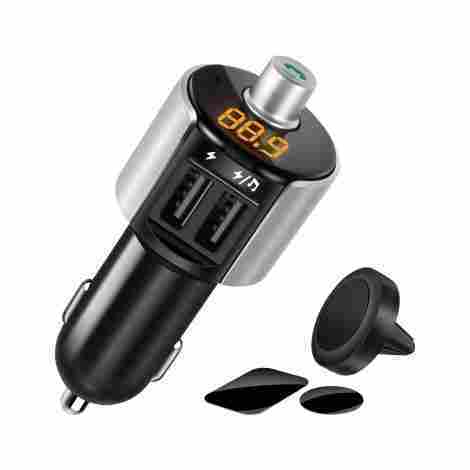 The price of this device is well below average for a Bluetooth FM transmitter. What's more? You get the same features you will get on transmitters going for double the price of this affordable transmitter. Making calls while driving needs to be done with a lot of consideration. What people don't often realize is that Bluetooth transmitters which come at a low price often come equipped with an in-built microphone for hands-free calling. Adding to other key features on this transmitter, then you are in for a blast. Getting the device to function effortlessly is one of the key features of any Bluetooth wireless adapter. 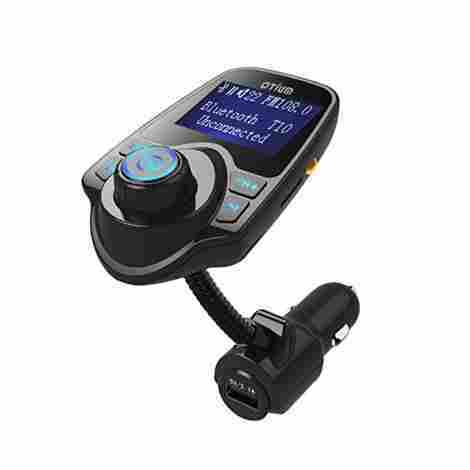 The Otium Bluetooth wireless radio adapter audio receiver FM transmitter takes the front seat in this aspect as it follows a simple step to start functioning. With a frequency range of 87.5 to 108 MHz, all you need to do is tune the car radio frequency to the same frequency of the adapter and you can enjoy your music on the device. The 1.44 inches LED display makes it easy to identify what frequency you are tuned into on the device. Considering the features of this device, it is an excellent pick. Still, the price the device comes in is on the high side when compared to other similar devices. So, individuals on a budget might be turned off. Although it is quite expensive, the features on this device give it a more positive appeal. Hence, if price is not an issue taken into consideration, this is a good product for you to try out. 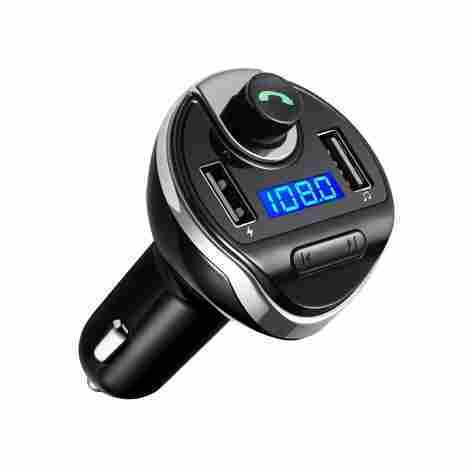 The IMDEN Bluetooth FM transmitter is another high-quality car adapter. It comes with dual USB ports which can both be used for charging. These ports are equipped with a smart charging IC which automatically detects when a device is connected. Unlike most adapters offering four music modes, this adapter offers just two modes. This is the USB disk which uses the right USB port and the Bluetooth mode. The microphone is also built-in and of high-quality with Noise reduction (CVC) and Echo Cancellation which makes it great when making hands free calls. 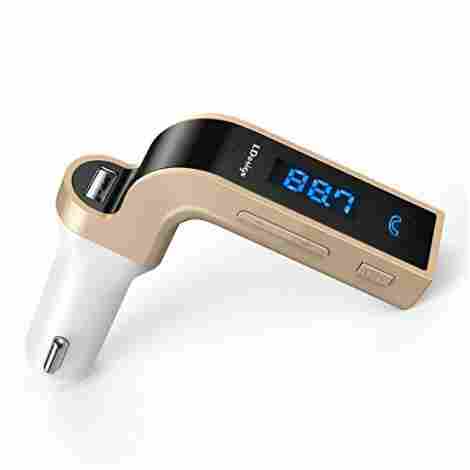 The IMDEN Bluetooth FM transmitter is affordable falling at a range which is below average for transmitters. Thus, if it's to your liking, you should definitely give the product a buy. With inbuilt microphone with nice suppression features and a reasonable price, you can enjoy music while using a USB flash disk. The device also pairs quickly and automatically so, it's certainly an excellent performer. 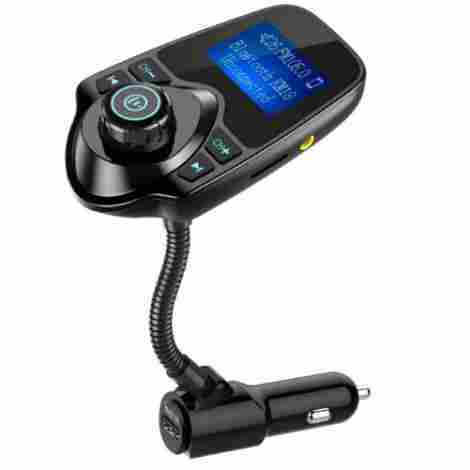 The Bluetooth FM Transmitter is another great transmitter with an innovative design which sells with a 60 day refund period. There is a frequency of range that spans from 87 to 110 MHz which is greater than the regular 88.1 to 107.9 on other transmitters. With this, you have a lot of options to avoid interference from local radio stations when making use of the device. with stable FM signal, anti-jamming design, can enhance the sound experience and noise suppression (CVC) technology, offer your hands-free talking and wonderful music. You enjoy the best price on this Bluetooth transmitter. Alternatively, we can say it has an average price for the high-performance features in its possession. There are a lot of upcoming names when searching for Bluetooth transmitters. What makes them unique is that they are all out to perform. This is an outcome of this competitive nature. There are lots of top-notch features to enjoy on this device and a notable feature is the dual charging ports. There is also a safety factor considered as these ports have a smart IC to make sure they deliver the right output for a device. Another Bluetooth car kit which offers the multi-point feature. The product comes with Bluetooth 4.1 technology which is still recent and can easily be used in ensuring quality connections with different devices. Also, the Bluetooth type means that the power consumption is reduced and the signal is more stable which translates to a much clearer audio quality. The clarity is in addition, enhanced by the A2DP technology which is incorporated into the device. A high-quality device which also comes at a slightly above average price makes all the features on this transmitter too competent. This is especially true when you consider it to other products in its price range and even beyond. Moreso, the price is not a limiting factor in its design as it incorporates the latest Bluetooth 4.1 and also comes with the A2DP and noise reduction technology. The most attractive feature of this transmitter seems to be the low power consumption which it offers. There is also the multi-point feature which allows you to connect up to two smartphones at once. This is one of the latest FM transmitters on the market that also offers the hands-free feature, so there is not much you won't get with the device. There is support for playing music from a TF card or from a USB device. It also comes with a 1.44 inches backlit LCD display. This provides the frequency, car voltage level, volume level, and other displays. Furthermore, the product is quite durable and uses a zinc alloy which is made from using an advanced plating process in production. There are lots of support which this transmitter offers so it is not so expensive since it is just bordering on average for Bluetooth FM transmitters. Dedicated control buttons on this device make it comfortable when you use your car stereo. An LCD Display screen also gives you full information on the condition and settings of the transmitter. Hence, it’s an ideal car Bluetooth adapter to invest in. The first consideration for all the devices on the list is the ease of use. This includes pairing and positioning of buttons. Pairing is usually easy for most but you will notice a lot of devices that often take a long time before pairing. In regards to the button, they must be comfortable and appropriately placed to aid the user experience. Not all Bluetooth devices make use of batteries as some use the car charger to function. For those that use batteries, you will need to know how long the batteries last. While standby time is usually long, with some up to six months, the batteries often last between 10 to 45 hours when you use them on trips. As you can see, most of the products above were well researched and hence, their battery performance is satisfactory. With a Multi-point pairing feature, you get to connect up to two smartphones simultaneously on the Bluetooth device. This also aids user experience since comfortability and functionality are further enhanced. A lot of Bluetooth car kits do not come with a dedicated mute button. For those that have, it enables you to silence the device while you are able to discuss with other passengers in the vehicle. So, we can say it’s a well-welcomed and appreciated feature. That said, some users might not mind the absence of the feature since all they need to do is reduce the car volume. There are lots of different stereos on various cars and also different types of phones. This implies that there will be some Bluetooth devices which are specially designed for a particular car or phone (namely in the case of outdated technology). This is why it is necessary you select a Bluetooth device which is compatible with your phone, stereo, as well as other devices which you may need to connect. Don’t end up having regrets about your purchase. The sound quality of any device you purchase should be thoroughly checked. In addition to ensuring the quality of sound is acceptable, you also need to consider how easy it is to increase the volume to maximum or reduce to a minimum, depending on the situation. Also, the quality of both levels must be qualitatively ensured. If you have a brand you are quite familiar with for the high-quality of products they sell, then buying a Bluetooth speaker from this company is the right choice. If on the other hand, they do not produce Bluetooth speakers, then you need to research. To find out a company that has been proven for its good work, you will need to talk to friends, family members, and other buyers. Talk to them about the device they are currently using and the performance. You will find a brand which is suggested by more people which you can buy. For anyone who is still having doubts, you should talk to an expert in the field of electronic devices. Someone who runs an electronic shop is your best bet as they have extensive knowledge of electronic brands. Like so, we picked products from our favorite brands which we know (due to our tests) that they’re exceptional performers. Having a budget is the first step to any purchase and working within that budget is also vital. But this is not an excuse to go for a low-quality device. You should make sure you are getting your money’s worth by selecting a device that offers quality for your budget. So, we selected the best bang for buck car Bluetooth adapters for you to check out and pick one from. Where can I buy Bluetooth car adaptors? Kindly visit a reputable online seller like Amazon for the best Bluetooth car adaptors in terms of functionality, price, and build quality (longevity). How do I pick a Bluetooth car adaptor by myself? It’s not that hard (for an expert at the least). So, you can use our “Criteria for Evaluation” section in that regard. Still, do keep note that our tests and selection methods aren’t limited to that also. There are a lot of instinctual tests that were made too. How do you operate a Bluetooth car adaptor? Operating a Bluetooth car adapter is always self-explanatory and you’ll even find the instructions on the product case. Most of the time, you only need to plug the product into the car lighter/turn on the Bluetooth and then pair/connect with your smartphone/device.